This is the second book in the Auntie Lily bedtime silly story collection. I liked it even more than the first. 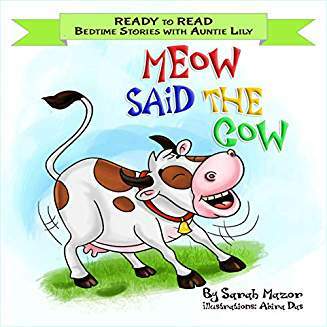 The lead character is a silly cow who tries to imitate other animals like a cat, hen, donkey, cheetah, monkey, snake and frog, to name just a few. In the process, children learn the characteristics of many animals. Rhymes are crisp and sharp, and the alliteration allows the sounds to roll off the tongue when reading aloud. Adults will enjoy this one as much as the children who are listening. Illustrations are vivid and expressive, allowing even the youngest child to clearly get the message. This book is a perfect choice for an older sibling reading to a younger brother or sister. Perhaps my favorite part is the riddle section at the end that asks the child to answer ten riddles. After reading the book a few times, many readers will be able to create their own riddles. This series is a clever, creative, interactive approach to learning. Highly recommended as a bedtime story or read aloud for toddlers, preschoolers, and elementary school age children. This beginning chapter book with fewer than fifty pages consists of an interesting and clever storyline. Floofy is an adorable Maltese pup who lives in Israel. She misses her mistress, Maya, who is off in America visiting Boston. Floofy is so depressed and lonely that she creates a virtual reality of herself and travels to America. 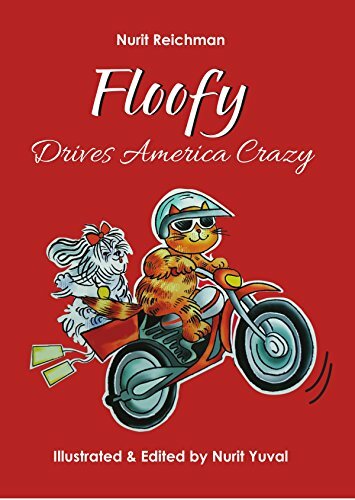 While visiting there, Floofy manages to meet a TV celebrity cat named Max and almost gets clawed to death by a Mama Bear while she is playing with one of her cubs. Floofy even manages to play match-maker and attends a virtual wedding. Beginning readers will love the animal and human characters but may get confused by the many sub-plot lines with connections that push the limits of reality. A few illustrations enhance the book. I would recommend this book especially for readers in the six to nine age group, who enjoy animal and fantasy stories. First in a series of early chapter books for beginning readers. Children will enjoy reading the large print and chapters of a few pages each. The main character is Bentley the dog who has adventures with animal friends and enemies like Rodney the Cat and Meezel the Weasel. In the first chapter readers are introduced to the family including the children Rebecca and Jonathan as well as Aunt Fanny who promptly sits on the couch and breaks it. Bentley, the puppy, is always blamed for breaking things and getting into mischief; all he wants is to be helpful and loved. When Rebecca loses her stuffed bear named Old Fur Face, Bentley hatches an ambitious plan to seek out and find it. This leads to a series of adventures with Rodney, the cat who despises him, a swim in the ocean, an encounter with a weasel, and an unexpected surprise upon arriving home that evening. Does Bentley ever get the recognition he deserves and will Rebecca find the missing teddy bear? At the conclusion of the adventure, Jones gives an enticing preview of the next book in the series in which Bentley observes a monster looking in the window! This promises to be a wonderful series for beginning readers. 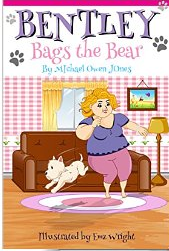 Jones seems to have found winning elements, a combination of endearing animal and family characters, humor, adventure, and family lessons to be shared. Highly recommend for young readers ages six through nine and for teachers looking to refresh their read aloud selections. Parents might also read a chapter a night as a bedtime story. This work of fiction is an adorable chapter book that has recently been released as an e book. It is part of a series featuring Larry the Liger. The story is marketed for ages two through eight. As a read aloud, it would need to be broken into several sessions for a younger child. The story is easy to follow, but there are few pictures to hold a young child’s interest. Children aged seven and up will find the story engrossing and want to read it to the end in one sitting. 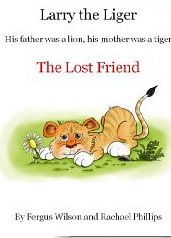 At the beginning of the story we meet Larry who is a “liger.” His mother was a tigress from India and his father a lion from Africa. How did they meet then? They were intentionally mated to create hybrid cubs. From the beginning, Larry was the largest. He had just returned to the zoo after being featured as the Easter Liger, part of the local children’s Easter parade. Larry lives in the Prague Zoo with his five siblings. He has many friends there. Larry spends a lot of time with Chloe the cat, but for some reason not understood by him; she is always mean to him. On this particular day, Chloe has blocked the hole in the fence so that Larry cannot get back to the zookeeper for lunch. When he finally succeeds in returning, the day has almost ended. He finds Chloe with a fat tummy sleeping peacefully. That really makes the usually mellow liger mad! He yells and screams at her. That must have scared her because she disappears. After two days, Larry is getting worried that Chloe might not be coming back. He finds that he actually misses that annoying little creature! So he sets out to find her. Larry discovers new friends like Olga the Owl and Cyrus the snake who are willing to help him in his quest. The journey and its outcome have unexpected results and teach both Chloe and Larry many things about themselves. This is a charming adventure story that is lovingly well told and carefully written both to entertain and to teach. Boys and girls will want to read it over and over. Don’t overlook this book. If you enjoyed reading this post, please subscribe to this blog by clicking on Follow at the lower right or hitting the orange RSS feed button on the upper right hand corner.